This doll’s house was built in the 1780s for the daughters of George III. It contains furnishings they made and decorated themselves. The walls retain their green ‘amoeba’ pattern wallpaper; similar in colour to fragments found at the palace itself. The house was later given away to the children of the captain of the King’s ship. 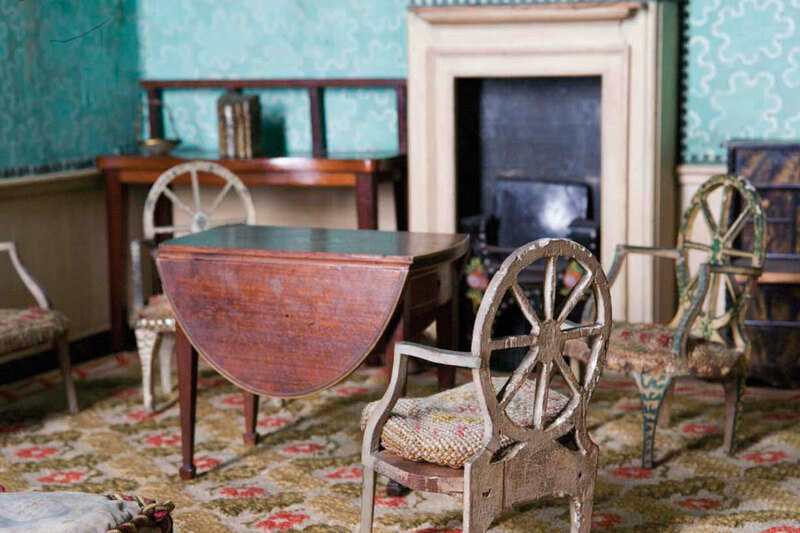 This doll’s house was built in the 1780s for the daughters of George III. It contains furnishings which they made and decorated, including the embroidered bed and chairs. The walls of the doll’s house retain their rather startling green ‘amoeba’ pattern wallpaper; similar in colour to fragments found at the palace itself. The house was later given away to the children of the captain of the King’s ship. It was acquired for Kew Palace in 2004 and has been painstakingly conserved by Historic Royal Palaces’ expert team.